It is suggested by some historians that this low scarped mound, some 500 yards to the West of Pickering castle, is in fact a siege castle, not a ‘motte’ as marked on the Ordnance Survey map. 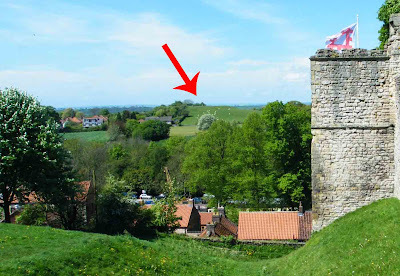 Visible from the Southern Gatehouse of Pickering castle, and also from the summit of Pickering Castle’s 20 metre high motte, the earthworks are visible as a flat topped mound, half covered with trees, topped with a bank, and encircled by a ditch and a low outer embankment. The summit is around 3 metres by 25 metres, and was occupied from the late 1930’s to 1991, by a Royal Observer Corps post (much like Sedbergh’s Castle Haugh) Consequently, it was damaged by its military occupation and use. It has been suggested that the siege castle was raised to threaten Pickering Castle during the Anarchy (1135 to 1154) a 19 year period of unrest throughout England, however no documentary evidence has been found that supports this theory. 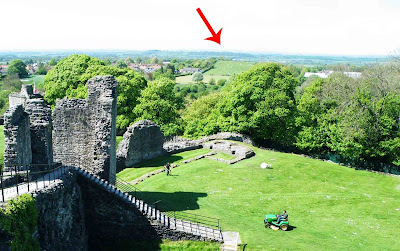 It’s therefore more likely, that it was built to threaten the castle during the period, 1216, 1217, during the first few years of Henry III’s reign. The damage done at this time to Pickering castle, necessitated the spending of several hundreds of pounds on the rebuilding and repair of the castle's fabric. You'll need to click on these photos to see them full screen, so that you can identify the siege castle on the horizon!